After quite a few years of ongoing efforts to grow corn on the cob that meets kashrus standards, free of insect infestation, it appears famers have prevailed with Hashem’s assistance. 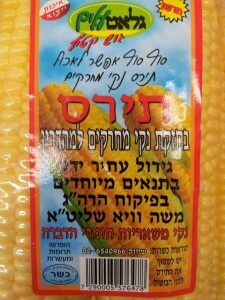 The corn on the cob in the photo below, from the Glatt Eilim Company, is indeed grown under controlled conditions and therefore can make the “insect free” claim. 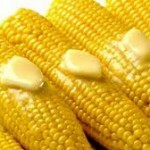 As per the instructions on the label one must wash the ears of corn prior to cooking. I spoke with Rabbi Moshe Vaye Shlita on Friday, 10 Elul 5773 and he confirmed that the hashgacha is indeed his and he assumes responsibility for the product. Posted on August 16, 2013 by JKN Israel. This entry was posted in General Interest. Bookmark the permalink. Is this like, 60% pesticides, though?? What about fresh strawberries and fresh figs? Insects! The Israel Health Ministry has established that because the “insect free” or so-called Gush Katif produce is regulated, pesticide use is lower than the other products that are not regulated. Ahhhhh – such good news for someone born and bred in Indiana! I don’t understand the problem. If it is buggy, then it’s assur to eat. Corn on the cob in America is not problematical. If the hechsher is examining ears with a jewelry loupe, this is beyond kashrus standards, since it is smaller than what is visible to the eye and is mutter. It is nice that you gave a plug to Rabbi Vaye’s parnassah. Maybe the ears of corn in Eretz Yisroel, have a different metziyus. I do not think the rabbi requires JKN for his livelihood. Anyone who knows the man understands the level of his expertise as a posek and being a person who has devoted himself to the matter of insect infestation and our food. One does not require a jewelers eyeglass as you imply. One only needs to take a class or two addressing insect infestation in corn and other foods to understand exactly what the issues at hand are. I can say with a heaping measure of confidence that the rabbis is well aware of what Halacha does and does not permit regarding the size of an insect. It would help the readers if JKN laid out the kashrus problem, particularly *why* it poses a problem vis a vis Halachah, and then explained how the Rabbis arrived at a solution. Many of us live outside Israel and are unfamiliar with who’s who in the field of kashrus in Israel or why Israeli produce may have different problems than that found elsewhere. As to pesticides, clearly they have posed a problem in the past. 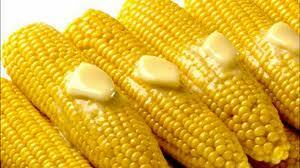 Corn on the cob in the US is also very infested, and to claim otherwise is just ignorance of kashrut on the ground. We bought regular corn on the cob this year, and much to our chagrin found the infestation claimed by kashrut experts and had to throw it all out. Thanks for the update, with Rav Vaye in charge, maybe we’ll try it again. Undoubtedly Rav Vaye knows the halacha well (he is probably the greatest expert today on this area) and his actions are l’shem shamayim. At the same time, however, it is important to note that many other authorities disagree with his strict interpretation, and have issued more lenient piskei halacha. For example, the differences in policies between the badatzim here and the kashrut agencies in the USA are not only a result of differences in metziut; they also reflect different positions about the halacha itself. Among other things, this is partially due to the fact that Rav Moshe Feinstein indicated in a late teshuva (YD 4:2) that his position was much more lenient. As always, one should check with his/her own personal Rav. i had some (bought from yesh in bnei brak). awesome! 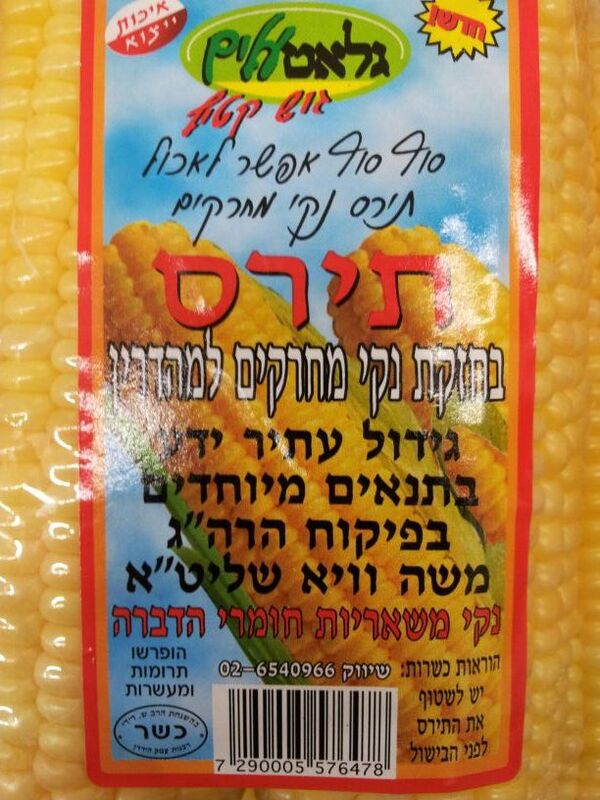 for a more detailed discussion about the whole issue of corn on the cob, read rav eitam henkin’s book לכם יהיה לאכלה (or at least the chapter on corn on the cob). how about the other regular issues terumos maasros, who supervises it? To Alan – that is an incorrect statement – R’ Moshe actually only wrote a limud zechus – not a blanket hetter – and that was only about what we see as as specks of dirt which under a loupe we can ascertain are bugs. Where do we buy it in Israel?